Sequencing is one of many skills that contributes to students' ability to comprehend what they read. Sequencing refers to the identification of the components of a story — the beginning, middle, and end — and also to the ability to retell the events within a given text in the order in which they occurred. The ability to sequence events in a text is a key comprehension strategy, especially for narrative texts. Sequencing is also an important component of problem-solving across subjects (Reading Rockets, 2015). Below is a short video that could be used as a starter to your lesson on sequencing of event. The video shows what each word in the comprehension strategy "sequence of events" means and the importance in knowing the components of a story in the correct order. In this video above the teacher models how a sequencing of events lesson should play out. She uses a lot of the words such as begging, middle, and end with emphasis to make sure the kids are hearing the words in context and comprehending them. By asking the students to give her a thumbs up after each event is written she is able to see who is understanding and who may need further assistance with sequencing of events. Differentiate which sequence chart to give to which students. The beginning-middle-end format is the simplest; other more complex maps can be used with more advanced students. Students can extend their understanding of sequencing into their own writing. 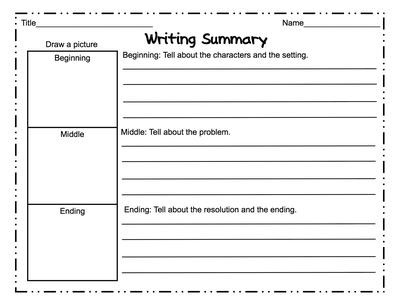 Students can use sequence charts to plan, summarize, and write their own main ideas, characters, setting, and plot for a story (Reading Rockets, 2015). There are multiple reasons why sequencing of events is an important comprehension strategy. Sequencing structures help students with different abilities organize information and ideas efficiently. It is an important component of problem-solving across the curriculum, including science and social studies. Sequencing also assists with comprehension (Reading Rockets, 2015). If students are encouraged to identify parts of a story they will better be able to tell or retell someone else what happened in the story. Rather than retelling in one big chunk students can think of it in pieces-- beginning, middle, and end. Through sequencing activities students are provided with the opportunity to examine the text and story structure, which, in turn, strengthens their writing skills (Teacher Vision, 2015). Reading-Students can sharpen their sequencing skills as they read independently, participate in small group reading activities, or listen to you read a story. Before reading a longer story with students, make charts labeled, "beginning," "middle," and "end." Pause after each section of the story to discuss what has happened and to record information on your charts. Writing- Sequencing is an important skill in writing. One way for students to plan their writing is by creating an outline or a graphic organizer before beginning a piece. This provides opportunities for students to think about the sequence of events in a story they wish to tell or the most logical sequence in which to provide information in a nonfiction piece. Math-Math provides many opportunities for students to think about a process for solving a given type of problem. This process can be thought of as a sequence of steps. Students can list the steps of a process, such as finding a common denominator for a pair of fractions, and work with partners to follow those steps while solving applicable problems. Social Studies-As students study history, they are often asked to keep track of series of events. Sequencing is a critical skill for this type of learning. Students can practice this skill by creating timelines showing the order of events. Students who are not yet involved in the study of historical events can still practice their sequencing skills by creating personal timelines, illustrating the course of their own lives. Science-Science experiments provide a great opportunity for honing sequencing skills. Not only can students practice following a sequence of steps to investigate a particular concept but many experiments provide a dramatic way for students to try to take a set of mixed-up instructions and put them in a logical sequence. Students may find that some experiments can only be done in a specific order while others can be done in a variety of sequences. For instance, one experiment to investigate the chemical reaction between acids and bases involves pouring a small amount of baking soda into a balloon. Vinegar is then added to the balloon. The gas produced by the reaction between the baking soda and the vinegar inflates the balloon. Students might extend this experiment by altering the sequence of the steps. Ask them if the results are same if they put the vinegar in the balloon first, for example (Teacher Vision, 2015).